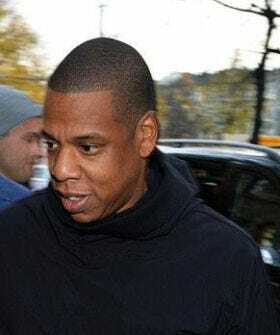 Jay-Z is facing mounting pressure to drop a holiday collaboration with Barneys New York following the store's recent racial profiling scandal involving two black customers. But, while the media ties itself into knots over the controversy, Hova is doing what he does best — keeping his cool. Yesterday, he issued a level-headed statement, in which he requested patience and understanding from the quick-to-temper public. "I move and speak based on facts and not emotion," his statement declared. "I haven't made any comments because I am waiting on facts and the outcome of a meeting between community leaders and Barneys. Why am I being demonized, denounced and thrown on the cover of a newspaper for not speaking immediately?" The answer: The American media has forgotten what anything other than a knee-jerk reaction feels like. On the other hand, given Jay-Z's past record of boycotting labels accused of racial profiling, it's not entirely surprising for people to expect some level of action from the celebrity, sooner or later. So, while fans pepper Twitter with their "ban Barneys" demands and an online petition makes the rounds, the rapper is trying to think, before just pulling the plug on the collaboration. He was quick to note that he does not stand to profit from the partnership: "This money is going to help individuals facing socio-economic hardships to help further their education at institutions of higher learning." He continued, "My idea was born out of creativity and charity... not profit."